MLS recently announced a new TV deal with ESPN, Fox and Univision. Besides the money (MLS is looking at $90 million a year give or take) the two major points of the deal are 1) the Sunday night block of games on ESPN & Fox and 2) the digital rights. MLS is now going to get a Sunday night block of games. One on ESPN at 5pm EST and then one on Fox Sports 1 at 7pm EST. This will finally provide some regularity to MLS’s schedule. 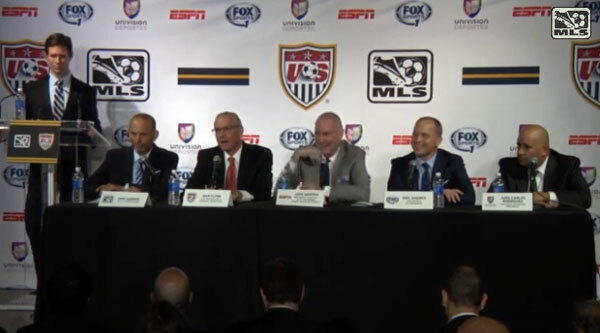 MLS and the networks believe that this will increase viewership for MLS. But it is asking a lot of the viewer. It may not seem like a lot to ask a viewer to change the channel from one channel to another but why should the viewer do all the work? This is not ground-breaking or abnormal. Viewers have been conditioned over the years to flip around for the games or shows they want to see. But it’s getting beyond the pale. The NFL makes viewers jump between five channels, the NBA four, and the NHL between three during the regular season and four during the playoffs. Let’s not forget the NCAA Tournament that has games on four channels or the UFC which makes users jump from an online channel to a cable channel to a pay-per-view channel in a matter of hours. You get the feeling that you’ll watch the first half of a game on one channel and then have to click over to another to watch the second half. The digital rights are going to go to ESPN. This apparently is still in the works because it’s still pretty vague in the media reports. Right now MLS has THE best digital deal. You can get MLS Live for around $60 a season and watch any out of market/non national TV game on any device from your Apple TV to your phone. Now ESPN is getting that. That means that DirecTV customers, who cannot get certain content on ESPN3 or the Watch ESPN app, are in big trouble. That’s 20 million subscribers MLS is leaving in the dark. Add that to the brilliant TV deal the Columbus Crew cut this off season and less fans will be able to watch games. While the TV deal is a windfall for MLS a good portion of fans have good reason to be sceptical. ESPN and FOX do not bat 1000 however they will hopefully kick the ball off at the scheduled time unlike NBC Sports.